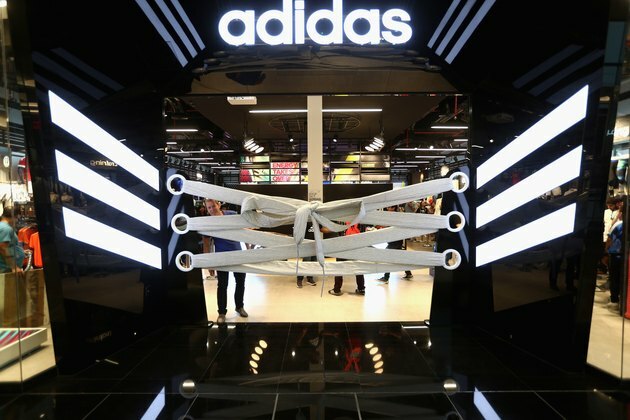 Adolf -- also known as Adi -- Dassler is best known as the founder of the Adidas company, whose three-stripe logo was to become synonymous with athletic shoes. By the late 1970s, the company was manufacturing 200,000 pairs of shoes per day and had expanded production to include sportswear, athletic bags, balls and other equipment. Adolf Dassler was born in 1900 in the Bavarian mill town of Herzogenaurach, Germany. He originally trained to be a baker, but when his family started a small shoe-making business, he turned his hand to creating footwear. The family started out making bedroom slippers using scavenged materials such as used tires, old helmets and rucksacks. As his sister cut patterns from canvas, Adolf used his home-made shoe trimmer, which was powered by a bicycle. Adolf, a sports fanatic, began transforming the slippers into lightweight gymnastics and soccer shoes with cleats. The family, including Adi's brother Rudolf, made enough money to open a small factory in 1926. The brothers first sold a shoe made specifically for tennis players, then began creating shoes for other sports. Their many technical innovations, including the first athletic shoe with arch support, made the shoes popular with athletes. The company added to its fame and gained publicity by giving away shoes to Olympic athletes at the 1928 Amsterdam games. Eight years later, Jesse Owens won the Berlin Olympics gold medal in track wearing the family's shoes. Dassler's company did not begin selling products in the U.S. until 1968, but Adidas shoes' popularity quickly spread among both serious and casual athletes and quickly became the top-selling American sports shoe. At the 1972 Olympics, every official as well as the vast majority of athletes wore Adidas shoes. The Adidas company also was highly successful in creating and selling its own line of sportswear. Adi Dassler died in 1978, at which time son Horst took over the company. How Has the Equipment of Basketball Changed Over the Years?